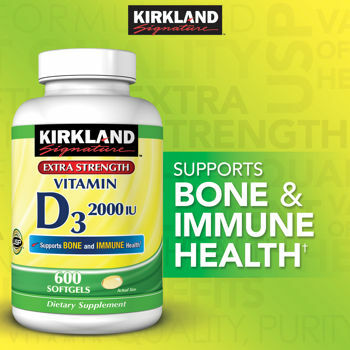 Kirkland Signature™ Vitamin D3 2000 IU - 600 Softgels SALE! Suggested Use: Take one softgel daily with a full glass of water preferably with a meal. Ingredients: Soybean Oil, Gelatin, Glycerin, Water, Corn Oil, Carmel (artificial color), Vitamin D3 (Cholecalciferol). No Artificial Flavors. No Preservatives. No Yeast, Starch, or Gluten. Keep out of the reach of children. Store at room temperature, tightly closed. Avoid excessive heat. As the scientific body of literature matures, the diversity of vitamin D’s influence in the body is being elucidated. Receptors for vitamin D have been discovered in cells throughout the body. Currently, the strongest science supports vitamin D’s role in bone, teeth, muscle and immune health. By enhancing calcium absorption from food and supplements and playing an important role in calcium and phosphorus homeostasis and bone remodeling processes, vitamin D supports strong bones and teeth. A common range of vitamin D recommended by healthcare professionals is 1,000-5,000 IU per day for general health. Your primary healthcare provider can assess your vitamin D status through a simple blood test that measures the level of the serum biomarker 25-hydroxyvitamin D and can recommend a personalized vitamin D supplement regimen to attain healthy vitamin D levels. Naturally, few foods contain vitamin D. Fatty fish (e.g. salmon, mackerel, sardines) and fish liver oil are among the best natural sources of vitamin D3, while egg yolks and cheese also provide small quantities. Mushrooms are a variable source of vitamin D2, with irradiated mushrooms offering enhanced vitamin D2 levels after exposure to UV light under controlled conditions. Fortified foods, such as cow milks, cow milk substitutes, infant formula, orange juices, breads and cereals, also provide a dietary source of vitamin D. Nationally representative research demonstrates that the large majority (93%) of Americans are failing to consume adequate vitamin D through diet alone. As a result, approximately 1/3 of Americans have a blood level of vitamin D that is insufficient or deficient.6 A vitamin D supplement can help address this key nutrient gap.